… are currently on hold for the summer. The next service project will be for September 2018. 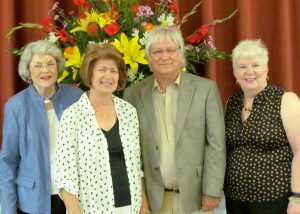 The Presbyterian Women held their annual gathering on Monday, May 21, 2018. Receiving the Lifetime Membership Award was Joyce Reid, left, and receiving Service Awards were Jeannie Plummer, Terry Plummer, and Jinnette Hathaway. 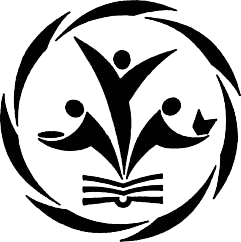 PW is a major organization of the church helping with the flower ministry, visiting the sick and homebound, preparing meals for bereaved families, working with children’s ministry, hosting special occasions, working in the Church Office, serving coffee and tea, making cookies, teaching Sunday School classes – the list goes on. Circles are small gatherings of PW for Bible study, fellowship and service. Every woman who is a member of First Presbyterian Church is also a member of PW and a First Lady. All PW are placed in circles but may attend any circle that they would like to attend. Hannah Circle: is composed primarily of working women and retirees. This circle meets in member’s homes the second Tuesday of each month at 7:00 p.m. This circle is very active in all church activities. Martha Circle: Members are active in church programs. They meet on the second Tuesday of every month, at 10:00 a.m., generally in the Parlor. First Chapter: Women meet on a monthly basis for lunch to discuss spiritual literature. First Chapter meets the second Thursday of every month, at either a local area restaurant, the church, or at a member’s home. First Stitches: Women meet as part of a creative circle, generally involving sewing.